“Christmas is like candy; it slowly melts in your mouth, sweetening every taste bud, making you wish it could last forever,” Richelle Goodrich once said. Unfortunately, it won’t last forever. But you can make it worth remembering when you do things you never did before, or go places you’ve never been before this season. With only a few days to Christmas, every fun-loving person should be thinking of an amazing place to be with loved ones, aside the traditional trip to the village for extended family reunions. From the place where nature is at its perfect form, to classic and ultra-modern environment, we present you a list of 10 unique places carefully selected from across the 6 geo-political zones in Nigeria to spend the Christmas vacation. Tinapa is a business and leisure resort located in Calabar, the beautiful capital of Cross River State in the South-south. The resort offers amazing features like a casino, children’s arcade, an amphitheatre, retail and wholesale outlets for your shopping needs and an 8-screen digital cinema. The Obudu Ranch Resort is one of the wonders of Nigeria and arguably the best vacation spot for anyone seeking to enjoy a holiday in an environment that offers a perfect blend of nature and modernity. The resort features a water park, a golf course and horse riding, night club as well as bonfires. A walk through the forest of Obudu brings one closer to nature as you listen to beautiful birds singing melodiously to your delight. If you are looking for a vacation spot to help you establish a lasting bond between you and your spouse or family, then Obudu is the perfect choice. The Abraka Turf and Country Club is situated along the bank of the serene Ethiope River in Abraka, Delta State. The first thing that hits one on entering the facility is the expansive and well-manicured plants with horses grazing on the lawn, which provides every visitor a feeling of calmness and tranquility. The resort features first class accommodation and catering services for people of different budgets, horseback riding, kayaking, canoeing, fishing and swimming in the mysteriously clear River Ethiope; the river is so clear that one can see fishes swimming in it. If you are a lover of nature and serenity, the Abraka resort is the place to spend your Christmas. Kofar Gamji Amusement Park was the first amusement park built in the heart of the Kaduna City. Located along the Shooting Range New Extension, it is indeed the most visited place during celebrations such as Christmas. It has wide lawns for relaxation, eateries, a swimming pool, and a terrace for couples who may choose to stroll hand in hand. The scenic view of the Kaduna River, which cuts across the park, is a pleasure to behold. Kofar Gamji is also host to CD World Play Club, where comedians, dancers and other performers entertain guests. 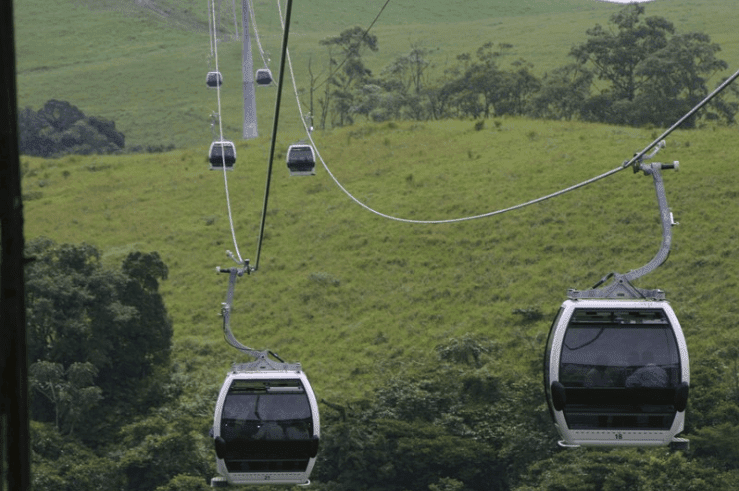 This 330,000 square meters’ ultra-modern park located in Nigeria’s federal capital is unarguably the biggest and most equipped park in Nigeria. The park offers leisure gardens for visitors’ recreation and rides as well as an amazing arcade. A visit to the Millennium Park would not be complete until one enters the popular Fulani Ranch that offers a variety of tasty local and intercontinental cuisines. A host of other restaurants and shops are also on ground to cater for your needs while at the park. The park also boasts of a clinic for treatment of minor injuries. With all these in place, you would be right to call the Millennium Park a fun haven. So, if you are planning a family picnic, a group get-together or want to spend quality time bonding with your lover, then this park is highly recommended. This large wildlife park located in Bauchi State came into being in 1956 as a game reserve but was later turned into a national park in 1991. The park covers an area of about 2,244 square kilometers and is home to about 50 species of wildlife such as lion, leopard, hippopotamus, antelope, elephant, and waterbuck as well as over 350 species of colorful birds. The reserve equally boasts of a decent and affordable accommodation for visitors. If you visit Yankari this Xmas, don’t forget to take a deep in the warm spring. But remember always to guard your belongings against the baboons! Also, known as the lake of treasure, it is located in Oguta, a quiet town about 30 minutes’ drive from the ever-busy capital of Imo State, Owerri. The most striking part of this park is the confluence of the Oguta lake which is blue in colour and the muddy Ulasi River, with both maintaining their unique colours. Even an attempt to mix the two by scooping water from one to another will only leave a stain for a short while; this is better seen than read or imagined! A deep into the Oguta Lake is also refreshing and safe as the lake is fresh water and does not harbor dangerous creatures. For your pleasure, the resort equally features a golf course with 18 standard international holes, cruise boat services for that exciting sail you have always imagined, recreational park, standard lodging accommodation and excellent restaurant. It also allows you to enrich your knowledge of history by visiting relic of war constructed by the defunct Biafran Navy during Nigeria’s civil war. This 8 square kilometers park is arguably the most developed man made wildlife park in Nigeria. It is a home to various wildlife species like lions, buffalos, crocodiles, hippopotamuses, horses, ostriches etc. The park equally features various attractions like a superb restaurant, picnic pine forest, video viewing centre and so on. This amazing granite rock used to be a place of refuge for the people of Egbaland in present Ogun State during intertribal wars in the olden days. It has several spot caves, some of which are about 20 feet long and 25 feet wide. However, this rock has been modernized with elevator, eateries, and many more to serve as a tourist destination. One can as well choose to take the staircase instead of the elevator to the top of rock. This serenity at the top of this rock is better experienced than told. Planning on a family vacation or picnic this Christmas, this amazing and scenic beach is the place to go. The live performances of Cultural entertainers add to the fun. The resort also offers restaurants and accommodation for all classes as well as sunbathing sites.